It seems like putting together the best bug out bag checklist is one of those things that every preparedness website tries to do. The thing that other sites often ignore is the fact that everyone has different needs and lives in different environments. This article will help you design the best bug out bag for you and your family! This article is going to cover everything that we at Ready Lifestyle believe should be on a bug out bag checklist. Then we’re going to give you a range of options to fill those needs. By examining each section, you’ll be able to tailor a kit to meet your needs, no matter what they are. Who Needs a Bug Out Bag? I always recommend bugging out only as a last resort, but that doesn’t mean that we shouldn’t be prepared to bug out. With our current political situation, both at home and worldwide, there is any number of possible scenarios that could cause us to have to leave our homes at a moments notice. If you live in an urban environment the need for you to have a well thought-out and prepared bug out bag is even more important. Everyone living in a city or a suburban environment is at an increased risk to experience riots, political and civil unrest, and will likely feel the effects of a man-made disaster before those in less populated areas. This doesn’t mean that those in a rural environment would never have to bug out. Many natural disasters, such as wildfires and hurricanes, could cause those in rural areas to have to bug out. Some people believe that after a disaster, those within the cities will migrate out to the rural areas. If this migration does take place, it’s one more reason for those in rural areas to have a bug out bag prepared. Preparing a bug out bag list and then building the best kit for your situation can definitely help you survive these scenarios. Follow this link to download our free bug out bag list. When deciding what to put on your bug out bag checklist , it’s best to choose those items that have multiple uses. This cuts down on weight and the number of items that you have to buy and carry. The items in your bug out bag should be able to get you through the first 72 hours of an emergency. Some people even go so far as to call this a 72-hour bag. Try to include items that will allow you to survive past the 72-hour mark. Sustainability and re-usability are important when choosing items. As an example, putting 72 hours of water in your bug out bag may seem like a good idea, but adding just two or three liters of water and adding a portable water filter will last you much longer. The climate, season, number of people in your family, etc. will all have an impact on what type of items we need in our kits. Make sure you take these into consideration when building your kit. Military surplus stores make a great place to get a lot of these items. I’d suggest swinging by one in your area and checking it out. They sometimes have great deals on gear that’s hardly been used. If yard sales and garage sales are popular in your area, these can provide all kinds of great gear. The best part is the sellers are often very motivated to get rid of items that they don’t want anymore. This means you can often negotiate an even better deal. The Teton Scout 3400 represents a sweet spot for cost, durability, and size. The base of any good bug out bag is the bag itself. When choosing a backpack there are several things to take into consideration. If you live in an urban environment, choosing a backpack that does not appear tactical can be an advantage. Being able to look like any other person on the street will make you less of a target if you are trying to evacuate a city (or other populated area) on foot. This grey man approach is often the preferred theory for people in cities and those that may be caught in a populated area. For those of you that live in a rural environment, a tactical bag may serve you better. These backpacks or often designed to effectively carry large amounts of equipment in a compact package. Camouflage patterns will also allow you to blend into your surroundings better. Regardless of the style of pack you choose, a subdued color is probably the way to go. Osprey makes great hiking backpacks in all colors, shapes, and sizes. This Aether AG 60 is designed for a week on the trail and comes with a removable top lid that can be used as a daypack. 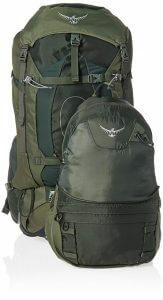 The adjustments available with the pack make it suitable as a bug out bag for almost all adults. Kelty is another well-known manufacturer of backpacks. The Kelty Redwing 44 is a little on the small side, but it would certainly work. It’s size also makes it less conspicuous compared to other hiking packs that are much larger. A bug out bag this size could be a great pack for an older child or a small woman. This Teton pack is 55 liters and is the most affordable pack we’re looking at in this article at right around $60. The Teton Scout 3400 represents a sweet spot for cost, durability, and size. It’s fully adjustable and pretty close in size to the Osprey. Something like this is what I’d recommend to anyone looking to build a new bug out bag. About the same size as the Kelty, the 5.11 Tactical RUSH72 has a ton of MOLLE webbing on the outside which allows for expansion if you really need it. Being on the tactical side of backpacks, it’s made of stronger, heavier material than the other packs and comes in several different subdued colors and camo patterns. If you’re looking to build a more tactical bug out bag, this could be just what you’re looking for. To keep your pack as stable as possible, load the heaviest gear next to your back and centered in the middle of the pack like the drawing above shows. Pack your lightest equipment in the bottom of your backpack with the medium weight loaded at the top and outer parts of the bag. Fill in all empty space and use any internal tie downs to secure your items in place. This prevents the load from shifting in your pack and it will allow you to fit more items into it. Women and shorter men often find that carrying heavier weight slightly lower in the pack is more comfortable. Heavy items should still be high in the pack, but feel free to adjust your load for your comfort. This is just a general guide, not a hard and fast requirement. If you’re interested in buying a pre-made survival kit, then you should read our review of the best survival kits on the market. Shelter can come in many forms. A lightweight backpacking tent may be the best option for some, for others, a tarp makes more sense as it can be a survival shelter and has other uses. It doesn’t matter what you choose, as long as you have a shelter in your bug out bag that makes sense for you. Many of these shelters can fill multiple roles on your bug out bag list. A purpose made tarp, like this Chill Gorilla 10′ Rain Fly, makes a great shelter. You can also use it to waterproof your pack, collect rainwater, etc. They’re extremely versatile on top of being light and not taking up much space. An old military poncho makes a great makeshift tent and can be used to keep you dry in the event of inclement weather. If you add a poncho liner you have both a blanket and an extra layer that can keep you warm when it gets cold. A small, compact sleeping bag can also make a good shelter while you’re on the move. Just remember that if you get a sleeping bag rated for 30 degrees then you’re going to be cold at 30 degrees. Some people like emergency blankets as they are lightweight and do not take up a lot of space. They’re designed to reflect your body heat and trap it in order to keep you warm. In my experience, you’re better off with something more robust than an emergency blanket. They do their job pretty well, but you’re going to be miserable if you’re in any kind of cold environment. For those that are likely to spend any length of time in an urban or suburban area, I recommend picking up Tom Brown’s Field Guide to City and Suburban Survival. The section on urban survival shelter building makes it a worthwhile purchase all by itself. Overall, it’s one of the best urban survival guides I’ve seen. You can buy it used for a couple bucks off Amazon. Having a steady supply of water will be one of the things that you battle with first. The problem with water is that it’s heavy and takes up a lot of room in a bug out bag. With that in mind, we always recommend having some form of portable water filtration system as well as several collapsible water containers or water bottles on your bug out bag list. Keep these containers full of water so you have something to drink when you first bug out. Then, as you empty the water containers you can refill them with water that you gather along the way. The Katadyn Hiker Microfilter is one of the best handheld water filters available. It’s a little on the expensive side, but you get what you pay for. Something along these lines is important for any survival situation. The Sawyer Mini is another great filter you may want to consider. 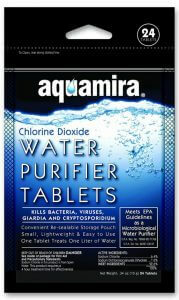 Aquamira makes several types of water purification chemicals. These water purification tablets would be a good addition to any bug out bag list as a backup to other water purification tools. This Aquamira Water Treatment kit can treat up to 60 gallons of water. That’s far more water than you could ever carry! Make sure you have something like a Life Straw for purifying water at a minimum! If you’ve included a mess kit or metal container of some kind, you can use that to boil water for an additional means of getting clean drinking water. Boiling water is a great way to ensure you don’t get sick from the water you drink. Bring the water to a boil for around 60 seconds and you should kill off most harmful organisms. The type of food that you bring along in your bug out bag should depend upon your environment more than any other factor. Freeze-dried food weighs very little but takes a lot of water to re-hydrate and cook. It probably makes sense for you to include freeze-dried food if you live in an area that has a lot of natural bodies of water. The Mountain House Pro Pak is designed with backpackers in mind. Each pack is one meal and comes vacuum packed to be as light and compact as possible. They come in a wide variety of flavors, so anyone should be able to find something they would enjoy. If you’re preparing to bug out in an area that doesn’t have a lot of natural water you’ll probably want to stay away from freeze-dried food. Instead, look for things like MREs that don’t require you to add water to them. Food like this will weigh more, but it’ll allow you to use what little water you have for drinking instead of cooking! Military MREsMREs are a great choice to add to your bug out bag for an all in one meal that can be prepared with no outside equipment. If you decide to go with MREs you can strip them down and take out anything that you will not need. Take the food out of the boxes, remove the heaters (you could reuse them as a makeshift warmer if you live in a cold environment), get rid of the extra spoons, etc. When you’re done, reseal the plastic bag with a piece of duct tape. You’ll basically cut their bulk in half! Once an MRE is broken down like that, it makes them a lot easier to include in your bug out bag. Putting Datrex Emergency Food Bars in your bug out bag is another option. They aren’t great, but they’re calories, take up very little space in a bag, last for a long time and don’t need to be prepared. Emergency rations of this kind can cause some people to get sick to their stomach. If you intend to include this type of ration on your bug out bag list, it’s a good idea to try them before an emergency so you know what you’ll be getting yourself into. These are a survival food and aren’t going to be very filling or palatable. 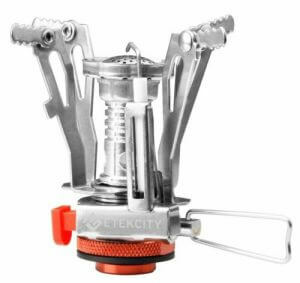 A lightweight stove like this Etekcity Ultralight Backpacking Stove takes up almost no space. They’re actually smaller and lighter than the fuel. You may also want to put a mess kit or cook set and some eating utensils in your bug out bag. A simple fishing kit makes a great addition if you live near natural bodies of water. Fishing line, some sinkers and some hooks should be enough to catch fish in a survival situation. The best part is a simple fishing kit like this takes up very little space and adds almost no weight to your pack. The amount of clothing that you need to put on your bug out bag checklist is minimal. When you’re determining what to pack, try to keep it light and non-bulky. In the end, you just need something to protect you from the environment that you’re likely to encounter. Packing light rain gear is always a good idea. Heavy-duty trash bags can be used as makeshift rain gear and have many other uses. If you used a poncho as your shelter, you’re already good to go with rain gear. You should have several changes of socks and underwear. This will let you change out the articles of clothing that come in direct contact with your body preventing chafing and blistering which can lead to discomfort and eventual infection when walking long distances. Keeping your feet dry on a long trek is one of the things that you should prioritize if you have to bug out. Packing your clothes in one or more Ziploc bags will help keep them dry and give you another bag that you could use later on. Make sure you have a pair of broken-in hiking boots or sneakers available. This will allow you to just grab your bag and change out your shoes. If something happens on your way home from work, you don’t want to be stuck walking around in dress shoes. The original Merrell Moab Mids are still among my favorite hiking boots. They provide a lot of support without being overly heavy or restrictive. Issues with your feet can stop you faster than almost any other type of injury. Go hiking in the shoes that you plan to wear when you’re carrying your bag. If you have problems with no weight on, you’re definitely going to have problems in a bug out situation. Gear Aid Tenacious Tape would be a great addition to any bug out bag. It’s an interesting product that could come in handy in a pinch. It’s specifically designed to seal leaks, rips, and tears in rubber, nylon, canvas and synthetic materials. Some of the lighter packs out there can tear pretty easily under hard use. If you’re using one of these, this repair tape would make a lot of sense. You can substitute this tape with a sewing kit if that appeals to you more. A flashlight or headlamp is a necessity. A headlamp allows you to use your light source with both hands-free. Adding a hands-free light of some kind to your bug out bag list should be your first choice. It’s easy to use a headlamp as a flashlight…it’s not quite so easy to stick a flashlight to your head. The Petzl Tactikka Headlamp has white light, strobe, and red light options. The strobe isn’t important but if you need to be tactical the red light will be. Having your hands free is a huge advantage when you’re traveling with a pack on your back and trying to carry a rifle or work with other items. LED headlamps like this have the added advantage of being able to last a very long time on a single battery. You also may want to consider something like a small LED Lantern or glow sticks to act as an area light at night. There are also several small lanterns that Goal Zero makes which are great for lighting small areas at night. I’m a big Goal Zero fan. The Torch 250 is a great area light that has a solar charger on one side and lantern on the other side. It also has a USB port that you can use to charge electronics and it can be charged from a USB port or a hand crank on the side. It’s a little bulky but I’d be happy including one on my bug out bag checklist. Make sure you don’t overlook personal hygiene items. Underestimating the importance of staying as clean as you can is a quick way to contract some kind of illness or infection! You need to be able to keep yourself clean especially if you end up living out of your bag for more than a couple of days. Normally a toothbrush, toothpaste, baby wipes, and a bar of soap will be enough to keep you clean. If you won’t have access to an outdoor water supply then you should consider packing more baby wipes and leaving the bar of soap at home. A roll of toilet paper doesn’t weigh much, but it can take up a lot of space. If you run into this situation you can remove a portion of the toilet paper from the roll and put it in a Ziplock bag to save space or just smash the whole roll flat and put it in a Ziplock bag. Toilet paper isn’t a necessity, but it certainly makes things a lot nicer if you have some! Make sure you include feminine hygiene products on your bug out bag list if you or a family member need them. Tampons and pads can also absorb a lot of blood if you’re wounded. They’re also reasonably sterile. A rifle should be the first weapon you reach for in any bug out situation. Being able to defend yourself is extremely important in a bug out situation. What you decide to bring with you to defend yourself is going to depend upon where you live. If you live in a rural environment then some form of light semi-automatic rifle is going to suit you best. I personally prefer an AR-15 but an AK-74 or 47 would be a good option as well. Having a rifle will also allow you to take game if it presents itself while you’re moving from point A to point B. Try to keep a rifle on your bug out bag list unless you absolutely have to remove it for some reason. It gives you much more capability than a pistol. In my mind, a rifle should be the first weapon you reach for in any bug out situation. Even if you’re in the city, a short barreled AR-15 pistol is a much better choice than a pistol in all ways other than concealability. Many people prefer a take-down rifle of some kind in their bug out bag. These are often .22 rifles. I’d rather have something with more power in case I want to take larger game or need to use it in self-defense. A pistol can be your best bet if you’re bugging out from a city or suburban environment. This allows you to conceal your firearm, drawing less attention to yourself. If you’re not concerned with drawing attention to yourself then a rifle on your bug out bag checklist is a better all-around choice. My preferred pistol is a compact 9mm like the Glock 19 or M&P 9C. For me, they’re the best compromise between capacity, caliber, and concealability. When you’re determining your load-out, two extra magazines are probably enough, but that is up to you to decide for yourself. Carrying more ammo will allow you to protect yourself for a longer period of time, but the weight of ammo adds up fast so keep it to the minimum you think will get you by. The survival bow is another interesting idea that has taken off with the increased availability of folding bows. Most of these bows would make a great addition to a bug out bag list. If you’re interested in survival bows, we have a full survival bow buyer guide. There are many things that we need to consider when we bug out, one of those that is often overlooked is protective gear. When I think about protective gear that makes sense in a bug out bag I think about gloves, glasses and possibly a dust mask. A plate carrier or body armor may seem like a good idea, but unless you have a very specific threat that you need to counter, I would stay away from something as heavy as body armor. A pair of light durable leather or mechanics gloves make a great addition to any tactical loadout. Protecting your hands from cuts, scrapes, and other injuries is going to help you keep infections at bay. They’re especially useful if you’re not used to working outdoors with your hands on a regular basis. I always add a pair of Mechanix Mpact Gloves to any bug out bag list. They’re light enough to give you a lot of dexterity and sturdy enough to stand up to pretty rigorous activity. The rubber coating on the knuckles and fingers really does help. I highly recommend them. Protecting your eyes is important for obvious reasons. Sunglasses are great while traveling during the day since they let you see more clearly and can protect your eyes from dust and debris. If you live in a very sandy area that is prone to dust storms I would consider adding goggles to your bug out bag as well. Brands like Oakley glasses are normally ANSI rated and withstand pretty severe impacts and still protect your eyes. I also recommend having clear lenses or another pair of clear glasses available for night time. This is even more important if you’re going to be stomping around the woods at night with minimal light. You’ve already been forced out of your home, you don’t want to have to deal with an eye injury at the same time. Especially since they’re so easily preventable. I consider eye protection a must for any bug out bag list. If you’re bugging out from the city, having some form of dust mask in your bug out bag makes a lot of sense. Dust, ashes and airborne particles are all very likely in many natural and man-made disasters. We all probably remember the images of first responders at ground zero during the attacks on 9/11. If I was caught in a similar situation, or an earthquake, I’d love to have a dust mask and some goggles. Wrapping a rag around your face is a decent stopgap but an actual dust mask will work a lot better! One of the best fire making devices available to anyone is a simple Bic disposable lighter. They’re inexpensive, light and readily available almost everywhere. The best part is they give you the ability to start fires with little to no training. Any bug out bag checklist should have a few. Extra lighters would also make a good barter item. Other than several disposable lighters you should consider packing a windproof lighter, ferrocerium rod, or waterproof matches in your bag to make a complete fire kit. An item that is often overlooked is the simple pencil sharpener. A small pencil sharpener lets you cut a stick into perfect kindling that lights very easily. A good first aid kit is an absolute necessity. Make sure you don’t skimp in this area. This is one of the most common bug out bag mistakes. 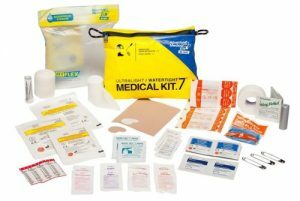 For normal cuts and scrapes, the Adventure Medical .7 First Aid Kit is great for this purpose because of its small size and the quality of the materials they pack in it. This kit will provide the base for your first aid kit. 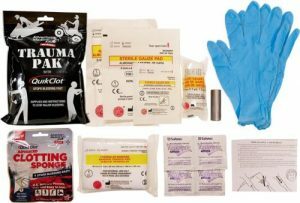 The Adventure Medical Trauma Pak comes packed in a single compact bag and covers most of what you need to stop a heavily bleeding wound. It’s only missing a tourniquet and a pressure dressing. Adding an Ever Ready Battle Dressing (AKA Israeli Bandage) to your Adventure Medical Kit fills in some of the weaknesses of that kit. Israeli Bandages are a great dressing, just make sure you understand how it works. If your first time seeing it when you need to use it, then it can be a little confusing. Watching this quick YouTube video on the subject and you’ll be up to speed without having to open yours. The Combat Application Tourniquet is a standard when it comes to tourniquets. Tourniquets are a bad word in a lot of communities. DO NOT BE AFRAID TO USE ONE! I say that all the time and I’m going to keep saying it until everyone understands that putting a tourniquet on someone doesn’t mean they’re going to lose a limb. For severe bleeding that you cannot stop, or you can tell from the outset that you will not be able to stop, this is a lifesaver. I don’t consider a first aid kit complete unless it has at least one tourniquet in it, preferably more. I suggest putting more in your bug out bag checklist if you believe you could sustain injuries on multiple limbs at once. Adding some painkillers could also serve you well. You’re likely to be sore if you’re not used to the kind of physical exertion that comes with bugging out. Some form of cordage should be included in your go bag. Normally the go-to item for this is paracord. It’s light, doesn’t take up a lot of room and the inner threads can be removed from the outer sheath making, even more, cordage if needed. Fire Cord is a newer invention that I’ve started carrying in my B.O.B. It has all the strength of regular 550 cord, but it also has a flammable fire starter core that makes getting a fire going really easy. Regardless of what type of cordage you choose, be sure to have enough to fashion a makeshift shelter, secure items and make repairs to items that may break. A quality fixed blade survival knife should also be part of your bug out bag. Fixed blade knives are normally stronger and have better handles than folding knives. They tend to be better suited all around for survival situations. If you’re going to put a folding blade on your bug out bag list then make sure it has a solid lock up when it’s opened. The Light My Fire Swedish FireKnife is a normal Mora knife with a ferrocerium rod in the handle. This is my go-to when I’m putting together any bug out bag. One thing that many people often overlook is the advantage that a small lightweight survival axe provides. A hatchet is great for all kinds of things from making and pounding in tent stakes to processing firewood. In many situations, having a quality hatchet with you can mean that you don’t need a heavy survival knife. There is little that a hatchet can’t do that a knife can and there are tons of things that a knife can’t do at all that is easy for an axe. A lot of people think the idea of a survival hatchet is crazy, or inefficient. This is the Gransfor Bruk Wildlife Hatchet. It’s just over a foot long at 13″ and has a 1 lb. 3″ blade. The entire hatchet is under 1.5 lbs! It can easily slide in your backpack or hang from the side. In my opinion, it’s one of the best survival tools you can have and should be considered one of the bug out bag essentials. Gransfor Bruks is my go-to company for all axes now. They’re beautiful, handmade tools that have a 20-year warranty. When I have this hatchet with me I almost never reach for a knife! I’ll stop geeking out over a hatchet now, but before I go on I just want to say they’re worth every penny and make a great addition to any bug out bag. Laminated maps of your local area, as well as a compass and a GPS, will allow you to find your way. Make sure you have them on your bug out bag list. It seems like something that you may not need, but it can mean the difference between making it to your bug out location and getting lost on the way. Make sure you practice with the compass and understand how to use it! When you’re trying to navigate during a bug out situation it’s not the time that you should be first pulling out your compass. A normal lensatic compass is going to be the best for true navigation. These survival bracelets would be a good backup for that compass and they have a fire starter and 550 cord. Most of the time I look at survival bracelets as more of a novelty item. They’re really one of those things that you don’t appreciate until you need them. Like the mini-survival kits below, I would use these bracelets only as a back up to other items that are already on my bug out bag list. The Garmin eTrex 10 is pretty bare bones when it comes to a modern GPS, but it has all the features you would need in a bug out situation. Regardless of the GPS you select, you should definitely have one on your list. In a bug out situation, it‘s a good bet that society probably has not completely collapsed. This means that your money will still have value and you can potentially use it to buy items that you need along the way. Bills in small denominations make the most sense so you don’t have to overpay for an otherwise inexpensive item. You can also use some of the items in your bag as bartering items. Just be sure that you don’t trade something that you’ll need down the road. I also don’t recommend specifically bringing items for use in bartering. It’s extra weight that is better used somewhere else. There are probably a lot of people that will disagree with me, but I really don’t believe that carrying barter items makes sense. I look at it this way. If you think you’re going to need more of something, add it now when you control the situation. Why pack a bunch of so-called barter items like cigarettes or alcohol in the hopes that you’ll run into someone who wants to trade for something you need later on…it doesn’t make sense. Having identification along with you will most likely make any encounters with the police or government go more smoothly. It’s lightweight so don’t forget to include it on your bug out bag checklist. Some form of identification could also be required if you decided to utilize emergency resources provided by a government agency like FEMA. If you’re wondering why I suggest using government assistance as a last resort, just look around on Google to read about the horror stories coming out out the Superdome during hurricane Katrina. We have quite a few things that need batteries on our bug out bag checklist and so far we don’t really have anything to recharge them with. That’s about to change. The Goal Zero Venture 30 Solar Recharging Kit with Nomad 7 Solar Panel is a portable solar charger and battery pack. The battery pack gives you the ability to store the power that you gather during the day in order to charge electronics at night. You can also hang it off your backpack to charge the battery pack as you walk during the day. To charge AA and AAA batteries the Goal Zero Guide 10 is great. Just make sure that you have non-lithium rechargeable batteries. It won’t charge lithium batteries, even if they’re supposedly rechargeable. A cell phone goes without saying. As long as the grid is up, your cell phone will continue to be an incredible asset to have. Don’t forget to add one to your bug out bag checklist. I prefer the most basic signal device out there. The signal mirror. They come in two varieties, glass and plastic. Plastic signal mirrors are less likely to crack but they scratch easier and aren’t as bright. Glass signal mirrors are bright and don’t scratch as easily. However, they can crack if they aren’t protected well. Either one will work, you just need to decide which style works best for you. Ultimately it’s up to each of us to come up with what the best tools are for us and our families. By reading through this article, and tailoring your bug out bag list to your needs, you’ll be ready if you ever need to bug out. Keep this in mind when putting together your bug out bag checklist, everything that goes into it should help us get from point A to point B, gain food, water and shelter. If something doesn’t do one of those things then it doesn’t deserve a place with you when you bug-out. Once you’ve completed a bug out bag list that makes sense for you, start by buying the most essential items…food, water, and shelter. Then branch out from there. You can probably fill most of the missing items with things that you have lying around the house! Once you’ve put together the bare essentials, you can then start adding more gear as time and money permits. Just like any other type of prepping, it’s important to not spend money that you may not have to put a bug out bag together. What does bug out bag mean? Normally the term refers to a bag (usually a backpack) that is loaded with food and equipment that can keep you alive as you leave one location due to an emergency (bugging out) on your way to another location (commonly called a bug out location). We believe everyone needs one. You can read our full answer here. Is a bug out bag necessary? Follow this link to find out why we believe a bug out bag is necessary. Why should I make a bug out bag? Follow this link to find out why we believe you should make a bug out bag list. How much should a bug out bag weigh? I would aim for 25 lbs as the ideal weight for your pack. It’s a lot more difficult than it sounds to get everything you need into a bag that only weights that much. With that in mind, staying under 35 lbs is probably okay. Just make sure you can carry that much weight for several days on end. A 35 lb pack starts to feel really heavy a lot fast than you’d think if you’re not used to it. What color should my bug out bag be? Your bag should be a darker, subdued color. Camouflage normally isn’t the best idea unless you’re sure that you’re going to be bugging out through a wilderness area or you live in an area where camouflage-patterned clothing and packs are normal. Use this link to jump to the discussion on choosing a grey man or tactical bug out bag. How much water do I need to include in my bug out bag? Follow this link to jump to the discussion about how much water is needed in your bug out bag. How much food do I need to include in my bug out bag? Follow this link to jump to the discussion about bug out bag food. What type of clothing should I put on my bug out bag list? Follow this link to go to the discussion about what type of clothing you should be in your bug out bag. What gun should I put in my bug out bag? Follow this link to jump to the discussion about what type of firearms you should be in your bug out bag. How much ammo should I include on my bug out bag list? You can follow this link to jump to the discussion about how much ammo you should pack in your bug out bag. What backpack should I get to carry a rifle? We suggest keeping your rifle at the ready or strapped to the outside of your bug out bag. If you really need to keep it hidden then a pack like the Tactical Assault Rifle Backpack is a good place to start looking. It’s relatively inexpensive and seems to be well constructed. You can also consider taking an AR-15 or AK pistol. How should I pack my bug out bag? You can learn how to pack your bug out bag here. Where should I buy a bug out bag? We suggest that you build your own bug out bag so that you have exactly what you need to meet your specific needs. If you don’t have the time or desire to build your own, you can find our recommended pre-built kits here. What type of axe should I put on my bug out bag list? You can find the discussion about which hatchet you should put on your bug out bag list here. Head over to our gear page for more informative gear articles. It’s a great place to get ideas about the best gear to put on your bug out bag list. Hopefully, this has helped you put together the best bug out bag checklist for YOU! This is the key component that many other bug out bag articles skip. There is no single list that can fit every scenario. Know yourself, know your situation, and build your bug out bag based on your needs. What would you add if you were putting together the best bug out bag list? Let us know in the comments. Creating your own bug out bag is one of the best ways to get started with prepping. I normally use a Garmin Foretrex when I’m out and about. It does everything I need it to do and the size makes it easy to stick just about anywhere. I like the ForeTrex too. It doesn’t have any fancy features or anything but it does what it needs to do. I have one hanging off one of the straps on my bug out bag. What do you think about putting a 22 in your bug out bag? I like the idea of a 22 since it’s so light and doesn’t really take up a lot of space. I actually wrote an answer to a similar question over on Quora about 2 days ago. I like a 22 as a survival rifle. They’re light and you can carry 1000 rounds of ammo with no problem. My real issue with putting a 22 in a bug out bag is the fact that you don’t have a decent defensive rifle. I prefer an AR-15 in almost all situations. I’m very familiar with them, the parts and ammo are plentiful in the U.S. and they can do pretty much anything you’d want a rifle to do. Having built a number of bug out bags in the past I can say that I agree with almost everything in this article. Putting together a BOB it really is all situationally dependent so it’s a very personal thing. I hate when people try to tell you what you should buy when they have no idea where you may have to bug out from, how many people are in your family, or where you could be bugging out to. Writing in an open ended way like this gives people the option to form their own opinions and put together a bug out bag that’s right for them. Thanks. We really tried to keep our bug out bag suggestions both generic and specific at the same time. You’re totally correct that it doesn’t make sense to tell people what they need when there’s no way to tell what their needs really are! I would hate for someone to build a bug out bag from using our suggestions and leave something out that they really needed. I urge everyone to take time when they put together a bug out bag since it really could save your life one day. Thanks for taking the time to stop by and leave a comment! you lost it, now you have lost those multiple uses. They don’t always perform like a tool that was intended for a specific purpose. You’re 100% correct. When you put all of your trust in one item in your bug out bag and it either functions poorly or you lose it, then it can definitely be bad. It’s a great point to bring up and something to really consider when you’re choosing what to add to your bug out bag. Do you want light or do you want redundancy? It’s something we all need to think about.